A child's diet should include plenty of milk, eggs, and meats. Soy, peanut butter, quinoa are also complete proteins and serve as a vegetarian alternative. Proteins are essential for a child’s growth. The body uses the protein from food items to make lots of specialised protein molecules that have specific jobs, such as making haemoglobin. When it comes to your child’s growth and development, there is no question about the importance of proteins. Protein is a macronutrient which is a must for every child’s growth and development. It is the building block of muscles, skin, enzymes and hormones, and it plays an essential role in all body tissues. Also, during the growing years, as children develop their bones, teeth, muscles and blood, they need nutritious food in proportion to their size. They may be at risk of malnutrition if they have a poor appetite for a long period, eat a limited number of foods, or dilute their diet significantly with foods lacking nutrients. If a child is growing slowly or is small for their age, they may not be getting all the protein and nutrients needed for healthy growth. Children who don’t get enough protein are also prone to health issues, like fatigue, poor concentration, delayed growth, bone and joint pain, delayed wound healing and decreased immune response. Children require proteins to stay active and energised. It is the only nutrient that supplies body cells with what they need to grow, build muscle and stay healthy. * Protein is the main food for tissues in the body. It helps build, maintain, repair and rejuvenate tissues and tissue cells in the body. * The body uses the protein from food items to make lots of specialised protein molecules that have specific jobs. For instance, the body uses protein to make haemoglobin (Hb). Thus, in children, lack of protein can cause fatigue and lethargy due to low Hb. * Proteins promote healthy metabolism. There are many hormones and enzymes in the human body like Insulin which are nothing but proteins. Eating plenty of protein rich foods helps to keep the metabolism running. Children who are actively involved in sports should thus eat sufficient amount of proteins. * Protein helps improve our immune system. Lack of protein may lead to symptoms such as weakness, fatigue, apathy and poor immunity, resulting in the child falling sick regularly. Protein improves the immune system. It ensures that the immune system develops and functions properly. * Protein helps in absorption of iron and calcium in the body. Lack of protein may lead to deficiency of iron and calcium. * By eating protein-rich foods throughout the day, children tend to feel fuller between meals. This could result in less snacking. Protein requirements depend on a child’s age and weight. 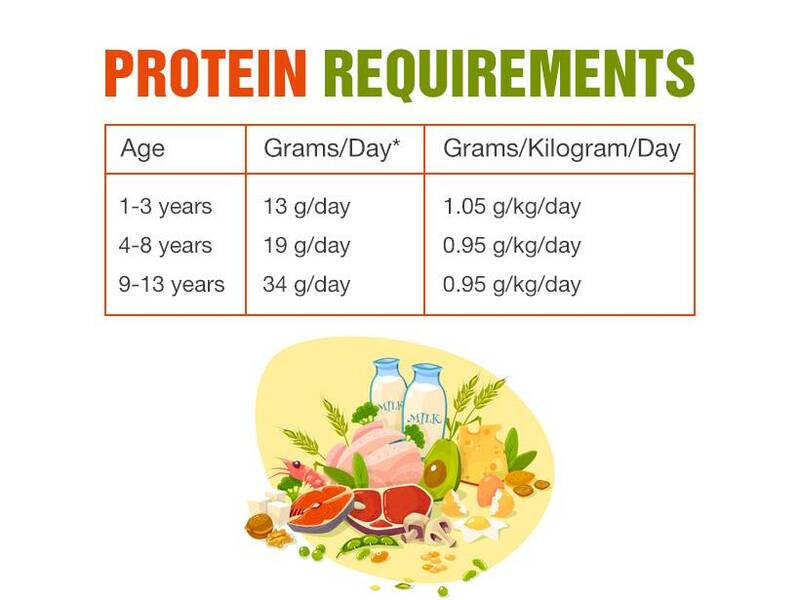 The 2015–2020 USDA Dietary Guidelines recommend the following amount of protein each day for children based on their age group. Until they reach 14 years old, the recommendations are the same for both boys and girls. In the later teen years, boys should be eating more proteins because they are still growing and tend to weigh more than girls. The need for protein decreases from approximately 1.1 g/kg in early childhood to 0.95 g/kg in late childhood. Protein intake can range from 5 per cent to 30 per cent of total energy, depending on age. There is no upper limit of protein. If the child is an athlete or is very active, the requirement can go up to 1.5-1.8g/kg/day. Having more than the required amount of protein will end up as stored fats and increasing the weight of the child. Of the 20 amino acids that make up protein, the body can produce 11 and the other nine must come from food. Protein requirements also depend on the quality of protein a child is getting and how easily digestible it is. In most cases, animal proteins are “complete” proteins because they include all the essential amino acids. They are highly digestible and considered of a higher quality than plant sources of protein. Hence, it is recommended that a child’s diet include plenty of milk, eggs, and meats. Soy, peanut butter, quinoa are also complete proteins and serve as a vegetarian alternative. Peanut butter is readily available in many shops. You can spread it on bread, cucumber or chapati and offer to kids. Hummus on bread, cutlets made of “kala chana”, paneer or soya can be a good evening snack. You can make lentil soups for your child and include beans and rice in his or her diet. Give your child sunflower and pumpkin seeds and ask him or her to snack on almonds. Boiled eggs can be added in morning and evenings. To facilitate normal growth and development, babies require plenty of high-quality protein. During the early months, breast milk and formula provide adequate protein. However, when a baby weans to table food, it’s essential to replace protein no longer being supplied by formula or breast milk, with appropriate food choices. In infants, healthy protein options include scrambled eggs, pea-sized pieces of cooked chicken, fish or red meat and beans. Toddlers can eat all the proteins that infants can eat, but they’re more likely to show preferences. Try a variety of protein foods and drinks to ensure they get enough to eat, such as nut butters, milk, cheese, Greek yogurt and pasta made with beans or chickpeas. Without protein, the body will fail to grow properly, lose muscle mass and experience problems with the immune system, heart and respiratory system. This is particularly important during the early years of infancy and the toddler stage, when the demands of development mean that getting the right amount of protein is vital. However, going overboard with protein consumption leads to risks, too. A study published in 2013 in Food and Nutrition Research found that too much protein early in life, specifically in the first two years, is associated with an increased risk of being overweight later in life. So, it’s important to get familiar with the minimum daily protein recommendations for your child’s age and also be aware of the signs and symptoms that can indicate deficiency of proteins.